Neusu's range of knitting organisers are premium quality products that are ideal gifts whether for yourself or a knitter you know and love. We have two designs, so you can choose the one that best suits your needs, depending on how much knitting, wool, needles and accessories you need to store. The Deluxe Knitting Organiser has four internal pockets for wool, all double height, so you can store and use up to 8 balls of yarn at one time. The organiser also features lots of pockets for all your neds, including 4 full length knitting needle pockets on the front, rather than the half height ones used in other designs. Finally, you needles won't fall out or get caught. There are also 4 half height pockets for corchet needles, a pattern pocket and external accessory pocket as well as two internal ones. The organiser is made from genuine tough canvas outer with real cotton inner. The Ultimate Knitting Organiser is for the serious knitter. It offers unrivalled storage and organisation for knitters, able to store up to 16 balls at once with eyelets and wool tabs to hold all of them. It's large! 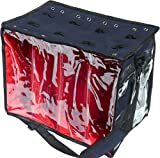 The front four compartments are all fully visible through the PVC side, and the organisers has enough pockets to store almost anything conveivable. There's a full size PVC knitting needle zipped pocket, and a full sized A4 pattern zipped pocket, plus an open pattern pocket on one end, and an accessories zipper pocket (scissors, needles, etc) on the other end. A padded shoulder strap lets you carry your knitting wherever you go, at home or on the move.